Graduating senior midfielders Alex Corpolongo and Jeff Reh were selected in the 2017 Major League Lacrosse Draft on May 28. Corpolongo was selected with the 50th overall pick by the Boston Cannons and Reh by the Long Island Lizards with the 70th overall pick. Corpolongo ended his Stony Brook career with 95 goals, finishing ninth all-time in Stony Brook history. He also recorded a stretch of 31 games with at least one goal scored dating back to his junior season. While Corpolongo will travel to Boston, Reh will be able to stay put on Long Island. 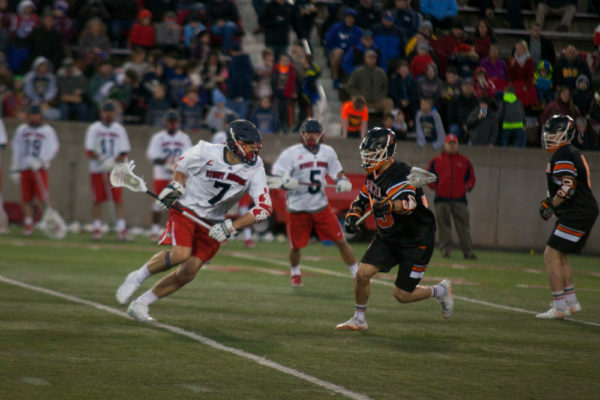 Reh finished his career at Stony Brook with 44 points, 113 ground balls and 35 caused turnovers. Stony Brook Women’s Lacrosse Head Coach Joe Spallina is also the head coach of the Long Island Lizards. Six other Seawolves have been selected to play professional lacrosse since the first MLL Draft in 2001 – Jason Cappadoro by the New Jersey Pride in 2006, Steven Waldeck by the Toronto Nationals in 2010, Kevin Crowley by the Hamilton Nationals in 2011, Jordan McBride by the Denver Outlaws in 2011, Adam Rand by the Rochester Rattlers in 2011 and Jeffrey Tundo by the Long Island Lizards in 2013. Crowley is the highest drafted Stony Brook men’s lacrosse player, going No. 1 overall to the Hamilton Nationals. Corpolongo and Reh were drafted following the debuts of four 2017 Stony Brook Women’s Lacrosse graduates in the United Women’s Lacrosse League, including Dorrien Van Dyke. The two Seawolves are set to make their professional debuts in the next few days as the draft takes place in the middle of the Major League Lacrosse season.